Do you go to Starbucks in the AM to grab that cup of joe? Many people do including one of my best pals, Samantha. She drives to work and (of course) on her route is a Starbucks where she grabs her coffee, her breakfast, and her lunch. I'm not kidding! She is a single parent of 2 boys, an executive, does not cook, and is super healthy. You should see this woman in a bikini. Of course, she doesn't do this EVERY day but when she is stretched for time - Starbucks is one of her solutions to her time crunch dilemmas. Why Starbucks? Does that look yummy? I tried this one at my local Starbucks - it is called a "Chipotle Chicken Wrap" and I was pleasantly surprised that it tasted pretty good. 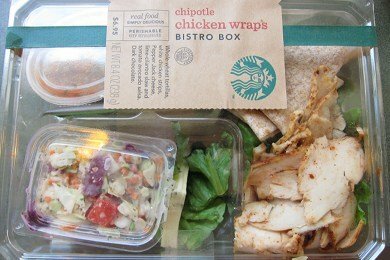 I paid $9 for my Tall coffee and Bistro Box ($6.95) - ouch! - but I would do it again. 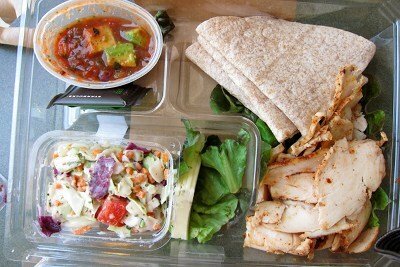 It featured grilled chicken breast, whole wheat tortillas, coleslaw, chipotle salsa, and a small square of dark chocolate. You sit down and make your own little wraps (this is not a lunch that you can eat while driving your car) and then eat your lovely chocolate feeling virtuous. Why virtuous? Because you managed to stay away from the chocolate chip cookies that were staring at you from the glass case. Remember, JUST the Big Mac from McDonald's is 540 calories - forget adding the fries and soda. If Starbucks had used more lime, chile, or cilantro instead of SALT to make these taste great they would have a home run in my book. Yes, I bet you smarty pantses noticed the 970 mg of sodium (40% of your daily value). My suggestion is to use these as a healthy lunch solution when you are pressed for time and make your own lunch when you can. They have chicken lettuce wraps, sesame noodles, and salumi with cheese bistro boxes for sale and they are a much better choice than many of the other fast food outlets. Starbucks' Oatmeal vs. McDonald's Oatmeal - Which one should you choose? Go Starbucks - this does look good! I haven't been to Starbucks in a couple years, but that sounds pretty good! The protein pack sounds really good too. how much do you want to bet most of that sodium comes from the chicken (pumped full of saline)? still, though, i'm a fan of starbuck's healthy options. i've def been known to grab their hummus & chicken flatbread! less that 300 cals and delicious! :) so is their eggwhite, feta, & spinach wrap! It's great to know that an establishment actually has real healthy options as opposed to the white "meat" chicken options that unnamed fast-food places have. It's great to see starbucks being more health conscious (now I hope they can "healthify" their muffins!). It is a little sad to see so much sodium in a "healthy option", I recently went to Costco with my brother and saw an instant soup bowl that had aprox. 1500 mg of sodium! Yikes! I also really love their veggie sandwiches...so good. Very excited to try this! Oh my, that looks good. I am going back to work (as soon as I can find a job) after being home 5 1/2 years. Guess I need to think about this as an option in my crazy schedule). The question is could I ACTUALLY make myself buy this over the cheese danish?? It does look tasty though. Yum. I like that they separate the wraps and chicken. Usually I hate wraps that are premade because they get all soggy. If only they were cheaper. Japanese bentos are also great for lunch. They're cute, which makes them fun & enjoyable to eat, and they can carry only a handful of food so you can't over pack. A lot of mothers use bentos to get their kids to eat vegetables and fruit during school time lunch. Plus, you can make them at night, let them sit in the fridge and just take them out in the morning. What are Japanese bento boxes? my issue with these meals is the packaging-- highly unclear if the plastic is recyclable, and there is so much of it!! These meals were great!! My roomate used to work at Starbucks and brought home all the ones that were about to expire. He got them free. Find someone you know that works there and you will be hooked up!! I wish they would create some gluten free bistro boxes. Every one of these has some from of bread, tortilla, etc. Excellent healthy choices while on the road (sales), BUT what is with the NON-RECYCLABLE PLASTIC packaging? Starbucks, you need to do something about this! Hi. Came across your website while searching the nutrition info on these wraps. According to the WW site calculator, these wraps come to 7pp, not 10. Just wanted to let you know.